Jim Goldberg, American (b.1953). 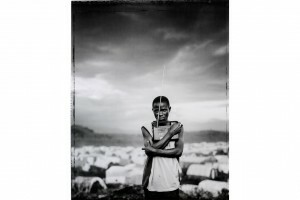 Prized Possession, Democratic Republic of Congo, 2008. Gelatin silver print. Gift of the Hall Family Foundation, 2011.37.11. KANSAS CITY, MO.- A fascinating study of contemporary photographic portraiture is on view at The Nelson-Atkins Museum of Art in Kansas City Aug. 9 through Jan. 9, 2014. About Face: Contemporary Portraiture highlights the breadth and global diversity of portraits produced since 2000. This exhibition includes 36 works by 29 artists from around the globe: the United States, England, Canada, France, Germany, Russia, Japan, Iran and South Africa. Artists featured in About Face include: Gohar Dashti, Deanna Dikeman, Gloria Baker Feinstein, LaToya Ruby Frazier, Ben Gest, Jim Goldberg, Myra Greene, Rachel Herman, Philip Heying, Pieter Hugo, Ken Kitano, Richard Learoyd, Jocelyn Lee, Andrea Modica, Laura McPhee, Michael Robinson, Lise Sarfati, Tomoko Sawada, Anna Shteyushleyger, Lauren Simonutti, Sage Sohier, Alec Soth, Jerry Spagnoli, Joni Sternbach, Hank Willis Thomas, Dylan Vitone, Charlie White, Vanessa Winship and Michael Wolf. Making Pictures of People – Museum presents digital exhibition of portraiture online While About Face is on view in its galleries, the Nelson-Atkins is also offering visitors an opportunity to engage with a digital exhibition of recent portraiture, Making Pictures of People, curated by FlakPhoto.com creator Andy Adams. This online presentation includes a robust selection of works from 27 photographers sourced from the web-based photo/arts community. Visitors are able to access the FlakPhoto exhibition, which is also publicly accessible to audiences worldwide, via touch screens in the gallery and on mobile devices outside the museum. Making Pictures of People features works from Keliy Anderson-Staley, Yolanda del Amo, Christopher Churchill, Paul D’Amato, Jess T. Dugan, Doug DuBois, Matt Eich, Jason Florio, Jessica Todd Harper, Dave Jordano, Dina Kantor, Stacy Kranitz, Molly Landreth, Graham Miller, Jim Mortram, Lydia Panas, Laura Pannack, Deborah Parkin, Cara Phillips, Richard Renaldi, Simon Roberts, Marjorie Salvaterra, Betsy Schneider, Tema Stauffer, Shen Wei, Carrie Will and Susan Worsham. Adams, Watson and Aspinwall see this collaboration as a way to broaden the dialogue about how curators, image-makers and audiences engage with contemporary photographic practice.